Nicknamed Thunder Road because bootlegger’s once roared along it in their hot rods, this one-time moonshine running route just east of Knoxville is also the birthplace of stock car racing. During prohibition, bootleggers removed the passenger and rear seats in their cars to make room for the shine, and added heavy duty suspensions to the back of their cars. And in their spare time they challenged one another to races. Years later NASCAR was formed to oversee the sport, and the rest is history. Today the bootleggers are gone, and this Northeastern Tennessee route is now aptly named the White Lightening Trail. The 200-mile drive features historic towns, a slice or two of Appalachian history and some absolutely gorgeous scenery. And although access varies along the route, the bulk of the attractions are doable for wheelchair-users and slow walkers. So save some time on your next Knoxville visit to explore the nooks and crannies along this infamous back country route. To be honest the one thing the White Lightening Trail lacks is moonshine — at least a publicly accessible supply. To remedy that, I altered the route a bit, for a short visit down to Gatlinburg, for a taste of the real thing. 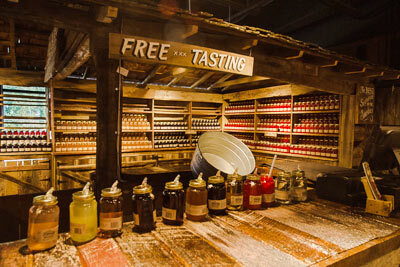 Located at traffic light #8 in Gatlinburg, Ole Smoky Distillery (865-436-6995, www.olesmokymoonshine.com) is the state’s first legal moonshine distillery. It’s just an hour from Knoxville, but it’s a pleasant drive through the scenic Smoky Mountains. Accessible parking is available in the lot behind the building, with elevator access up to the distillery. There’s plenty of room to maneuver a wheelchair around the interpretive exhibits that explain the distillation process, prohibition and bootlegging. There’s even an old 1962 Chrysler on display, which was the car of choice for bootleggers. And if you stick around long enough you’ll even be treated to some down home musical entertainment. But of course, the moonshine is the main attraction, and inside you can choose from many varieties; from the traditional recipe, to the more trendy seasonal flavors like lemon drop or pink lemonade. Free samples are available for those over 21, and the employees are sticklers for checking IDs. They also have a whole store full of canned products, from hot sauces, jams and jellies, to regional delicacies like pickled green beans. And of course there’s no shortage of Ole Smoky branded swag. Access is good throughout the building, and it’s a great place to learn a little bit about moonshine — legal and otherwise. After you’ve had a taste of shine, head north on Highway 66, then take Highway 139 east to Dandridge. You’re now officially back on the White Lightening Trail. Dandridge is a historic little town, and as such there are some bumps in the sidewalks, but for the most part the pavement is level and there are curb-cuts at most corners. Be sure and stop at the Visitors Center (137 E. Main), to pick up a town map that points out the historic buildings. 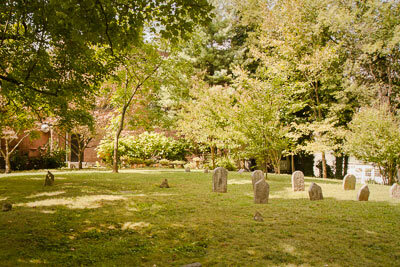 There’s also a revolutionary cemetery across the street from the Visitor Center, and although there are six steps up to it, you can still get a pretty good view from the sidewalk. 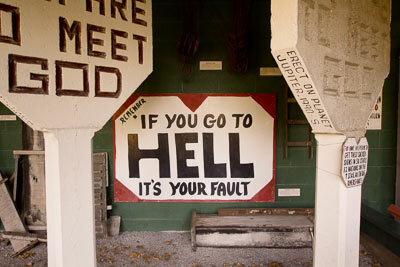 Be sure and stop in at Tinsley Bible Drug (865-397-3444, www.tinsleybibledrugs.com), for a look at the old lunch counter. I’m told it’s the best deal in town for lunch, but if you can wait just a few more minutes, there’s a tastier option just down the road. Still it’s worth a look inside, as it’s like a step back in time. 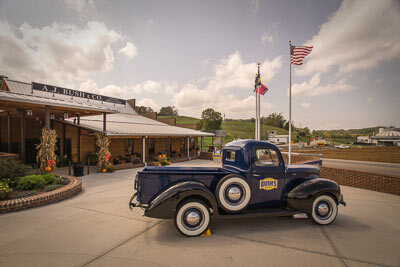 Bush’s Visitor Center (865-509-3077, www.bushbeans.com), which is located just up the road on Highway 411, is also worth a stop. Originally opened as a tomato cannery in 1904 by A.J. Bush, this baked-bean giant now produces over 35 varieties of canned beans and hominy. There’s accessible parking near the entrance, with ramped access to the general store and museum. Inside you’ll take a virtual tour through the canning plant, learn a few fun facts about beans, and see how the company evolved over time. And at the end, you can even get your photo taken with owner Jay Bush and his dog Duke. Although the museum is interesting, the main attraction is really Bush’s Family Café, located next door to the general store. There is good pathway access inside the restaurant, which serves up everything from hamburgers to ham dinners, with more bean choices than you can ever imagine. And don’t forget to try the pinto bean pecan pie, which strangely enough, is delicious! After you’ve had your fill of beans, continue along Highway 25 E to the Kentucky border, where you’ll find the Cumberland Gap National Historical Park (602-248-2817, www.nps.gov/cuga). Long used by Native Americans, this natural passage through the Cumberland Mountains was widened by Daniel Boone and a team of loggers, and later used by pioneers who explored western Kentucky and Tennessee. It’s not exactly an off-the beaten-path destination, as the highway there is pretty well traveled; but it is a very scenic drive. Accessible parking is located outside the Visitor Center with level access to the entrance. Inside there’s a museum, a theater and accessible restrooms on the first floor. After you’ve watched the movie and browsed through the interpretive exhibits, pick up a park map and head out to Pinnacle Overlook. It’s just a short drive, and you’ll be able to see Virginia, Kentucky and Tennessee from the viewpoint. The main trail out to the overlook is located next to the restrooms, but it has a steep incline and many steps along the route. The accessible trail, which is not well marked, is located on the other side of the parking lot, next to the accessible parking place. 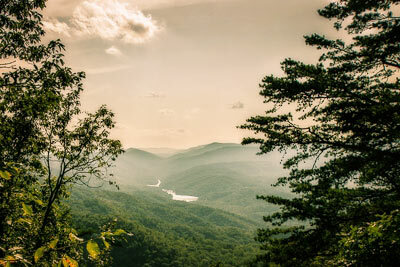 Once you know where the trail is located, it’s a piece of cake, as there’s a barrier-free path out to the overlook, where you’ll be treated to a beautiful view of the Cumberland Gap. The White Lightening Trail is best done in two or three days; and the Hampton Inn in Caryville(423-562-9888, www.hamptoninn.com), is an excellent place to take a break along the way. Not only does the property have some nice accessible rooms, but the owner has an interesting family display of local moonshine history. There’s level access to the lobby, from the accessible parking place near the door. Inside there’s barrier-free access to Room 106, which is located near the lobby. 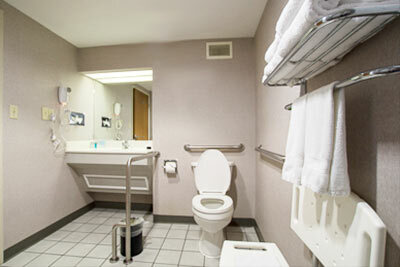 This accessible room features wide doorways, a lowered peephole and plenty of room to maneuver a wheelchair. 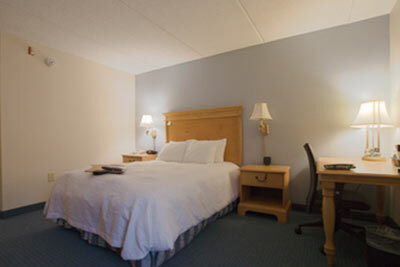 It’s furnished with a 25-inch high bed with wheelchair access on both sides. There is also level access out the back door, which opens up to a walkway around the property. 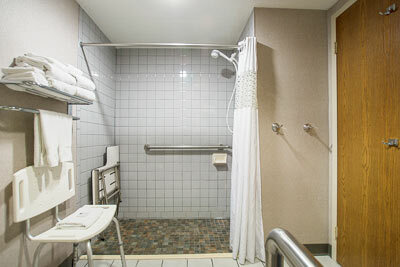 The bathroom has a roll-in shower with a hand-held showerhead, grab bars and a fold-down shower seat. There is also a roll-under sink and a portable shower chair in the bathroom. The toilet grab bars are located on the left and back walls (as seated), and there’s a free-standing grab bar on the right side, approximately 30 inches from the toilet. All in all, the room will work for people with a wide variety of access needs. There’s also level access to the breakfast area, where you can enjoy your meal and browse through the large collection of family memorabilia dating back to prohibition times. Owner Hack Ayers is proud to tell just about anybody who will listen, that he comes from one of the best known moonshine families around. And he has the documentation to prove it. The hotel is filled with old photos, clippings and a few rather macabre objects that illustrate moonshine history in the area. At the top of the list the jacket that Hack’s dad wore when he was gunned down in a whisky raid in 1943 — complete with a bullet hole in the pocket. Outside there’s a 1929 roadster, and a nice area to relax and enjoy the beautiful view. It’s a fun, accessible and somewhat quirky place to stay; but it fits in nicely with the theme of the drive. 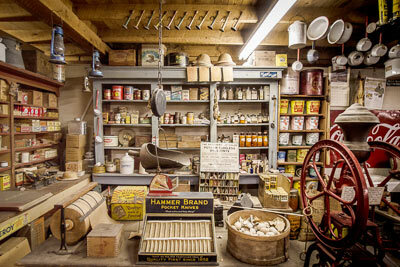 Save at least a half-day to explore the Museum of Appalachia (865-494-7680, www.museumofappalachia.org), located in nearby Norris. Known as the most authentic and complete replica of Appalachian pioneer life in the world, this living history museum spans 65 acres. Accessible parking is available near the mailbox (just look for the chicken crossing sign), with ramped access to the gift shop through the service entrance. A wheelchair is available for loan at the front desk, and since this open-air museum is pretty large, it’s a highly recommended option if you tire easily. Accessible restrooms are also available in this building. Outside access is variable, and some buildings have level access, while others have one or two steps at the entrance. The good news is, many of the inaccessible buildings are small, so it’s easy to see inside of them. 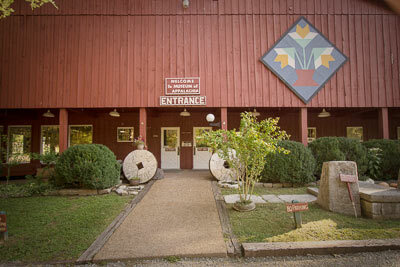 There’s level access to the Appalachian Hall of Fame which is filled with historic photos and artifacts, and a large collection of Cherokee baskets, pottery and arrowheads. “What better way to know a people than to study the everyday objects they made with their own hands?”, reads the sign above the exhibit. Outside there is level access to an old jail cell and the adjacent barn room, which is filled with old farming implements. And don’t miss the Peoples House, which contains an interesting exhibit about Harrison Mayes, who traveled the country and erected concrete crosses along the way. 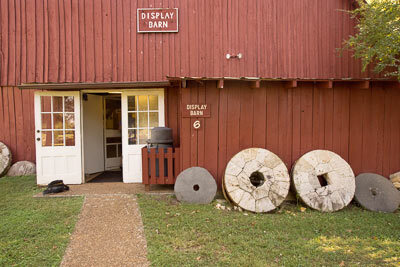 The rest of the complex is dotted with old farm houses and cottages, with costumed docents on hand to demonstrate crafts and old time daily living skills. Many of the paths are level and topped with decomposed gravel, so they’re easily accessible. And don’t forget to stop by the restaurant, which is located next to the gift shop, for a spot of lunch before you depart. Top off your White Lightening Trail tour with a little treat on your way back to Knoxville, with a stop at Hoskins Drug Store (www.hoskinsdrugstore.com) in downtown Clinton. Established in 1930 to serve the Tennessee Valley Authority and textile mill workers, this store was the first of what grew to be an eight-store chain. 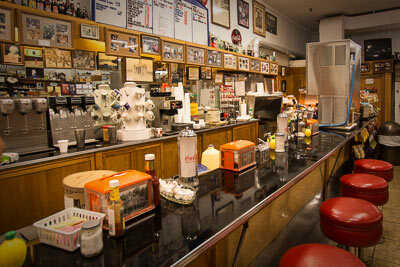 It still retains much of its old time flavor, and includes a small lunch counter and a soda fountain. There’s accessible street parking available on Main Street near Leinart Street, with level access to the drug store. Inside there’s plenty of room to roll around between the aisles. There is counter and booth seating in the restaurant, and there’s room enough to sit at the end of the booth if you can’t transfer. 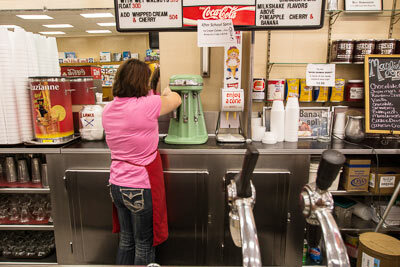 Although there’s a good number of lunch selections on the menu, the best thing to get at Hoskins Drug Store is a good old fashioned milkshake. It’s not low-calorie (quite the opposite in fact), but it seems the fitting choice considering the locale. So sit back, slurp down the calories and take a short trip back to yesteryear. Then, pack up your memories and head back to civilization in downtown Knoxville.